Have you ever been scheduled to meet a new vendor, and you’ve taken a few minutes to Google them? Have you ever found information that you were glad to know, but which made you decide NOT to do business with them? This happens every day- and the reason is that when people find negative information, or no information at all, they question your trustworthiness and capability to provide them what they need. If you know you need to improve your online reputation, and are wondering how to begin, this article will help. To manage a reputation, you need to first have a reputation to manage. This means that you need to build your online presence. The ways in which you do this is to build a website, build out various social media platforms, and your email list. Then fill them with the right content for your audience depending on where they happen to be in their buying cycle. The more content you create, especially in various formats, the greater your business credibility. Once you have an online presence, it’s imperative that you work to manage your reputation. To do that you’ll need to start monitoring it and managing it. The best way to do this is to use Google Alerts to conduct searches on your brand name, your personal name, and your industry. This will help alert you to issues that arise. In addition, pay attention to what’s going on in your own groups, ratable social sites, and on your blog post comments. Be sure to present a consistent brand “face” across your social media channels, and interact with your audience and customers. You must create content for every stage of your buyers’ buying cycle. The basic buying cycle can be followed by using the AIDA content marketing strategy which consists of attention, interest, desire, and action. If you create all your content with this in mind, you’ll be able to fill all areas, online and offline, with the right content in the right format and send it to your audience at the right time. Understand that most customers will need multiple touchpoints with your brand in order to decide to buy. One thing to remember about the content you create is that you need to market the content in the same way you market your services. Publish all blog content on your social media sites, share the blog post through your email marketing, and tell as many people as possible about each new piece of content just as you would your services. In this way, when people conduct searches on you, they’ll find the content you want them to find. Each piece of content you create builds your expert credibility. An awesome way to get more out of your content and your brand is to get other people to promote you. You can do this by being an amazing customer service provider, producing amazing products and services, as well as giving other people an incentive to do so such as through an affiliate marketing program. In this case, you only have to pay someone if a paying customer is sent your way by the affiliate. Occasionally, you’re going to get negative reactions. In fact, if you never get one you may not be promoting enough of your content to others. Once you finally get a negative comment or reaction to something you do, consider it a plus. You’re finally on someone’s radar. Develop a plan for you (and anyone else who works with you) for how you’ll react to negative comments. The main thing is to be positive, professional, and fix the issue when you can. One way to spur your reputation in the positive direction is to tie your work to a charity or cause that your audience cares about. This can be tricky, so you may need to poll your audience to find out what charities they care about before getting too involved. Most of the time it’s best not to pick something too political. Finally, always be consistent. Be consistent with your marketing. Be consistent with your social media profiles. Be consistent in your branding and the voice of your brand. You want your audience to recognize that the content is from you before they see your name. You want them to see your branding and know exactly who that is and what that means. Consistency is the key to making this happen. 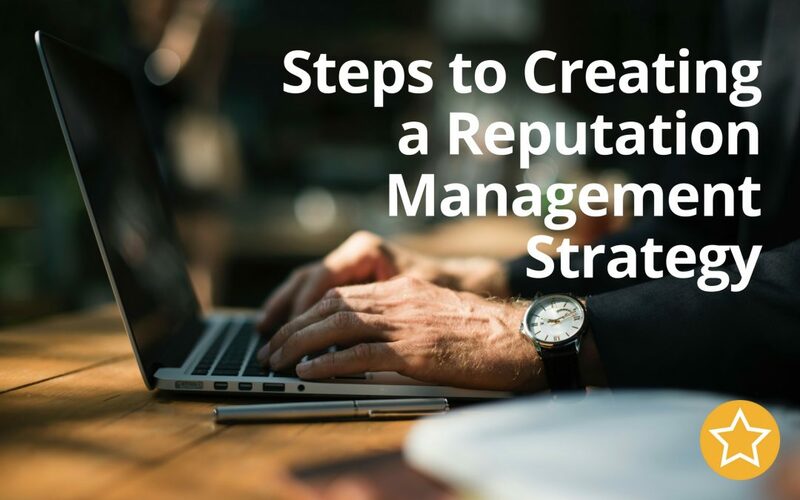 These steps to creating a reputation management strategy work for any type of business – whether it’s a bricks-and-mortar business or an online business. It also works whether it’s a product-based business or a service-based business.